Our school residencies can be modified for one-week or multi-week residencies. Our teaching artist will work with classroom teachers to design a curriculum that best fits your goals, project scope and aligns with the California Content Standards in the Visual and Performing Arts for the selected grade level. Residencies offer students a chance to explore elements of shadow theater in depth while teachers can use the residency as a staff development opportunity to learn how to teach lessons themselves. Residencies culminating in a performance are typically take place one or two days a week for at least ten weeks. We strongly recommend that time be set aside for teaching artists and classroom teachers to work collaboratively to integrate the multi-disciplinary art form into their weekly lesson plans. Our teaching artists are a great resource for learning to create shadow theatre in your classroom, teaching world history, mythology and storytelling! Rates: Depend on the scale and scope of the project and may be adjusted to fit school budget restraints. If the workshop site is outside of the San Francisco Bay Area, transportation and housing costs will be added on top of the workshop fee. Space Requirements: A theater stage, which can be completely darkened, is the ideal location for the workshops, since it is most efficient to have one place in which to develop and perform the piece. However, any size room can work, as long as there are window shades which can be completely closed for darkness, and enough space to accommodate a paper screen that is at least 8 feet tall and 8 feet wide with 8 feet of space behind it for performers and lights. Equipment & Materials: In most classes, we use overhead projectors as the light source for the shadow plays. In some cases, we may provide our custom-made lights, which require only a regular grounded three-prong electrical outlet in any location. Also we typically request that you provide other materials such as paper, card board, tape, scissors and clear plastic transparency sheets. Our teaching artists will help you come up with a comprehensive list for your class. Plan, develop, design, produce, and perform a production: Our brand of Shadow Theatre is a unique art form where theatre, visual art, literature, movement and film-like effects are manually integrated. The students will acquire the vocabulary and capability necessary to navigate through these different disciplines in order to create their own original shadow theatre. Integrate what they learned into practice: The multidisciplinary nature of our art form makes it a perfect tool for integrative learning. In the past, our partner schools have combined our program with language art, social studies, science, and visual art classes. Learn how to use communication, organizational and assessment/problem-solving skills: Students have a rare hands-on opportunity to work together towards a common goal: a production where cooperation and collaboration are necessary for success. This hands-on approach has been especially effective for our partner schools, providing a strong framework for individual and collective growth. Backstage "Ghosts of the River"
One day and multiple day workshops are available. Our teaching artists will work with classroom teachers to create the best curriculum for your students in grade levels: K-12. The multidisciplinary nature of our art form makes it a perfect tool for integrative learning. In the past, our partner schools have combined our program with language art, social studies, science, and visual art classes. Participate in a hands-on project with particular elements of the art form such as: puppet/mask making, experimentation with light sources, exploring dramatic structure, and character development. 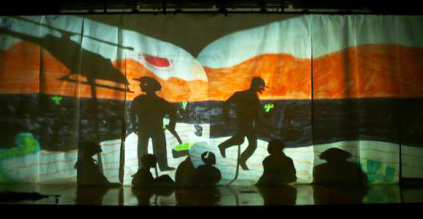 ShadowLight Productions offers age-appropriate assembly performances by professional shadow theatre artists for students ranging from kindergarten through high school. Shadow theater presentations highlight dramatic and comic stories from world folklore, as well as, original contemporary tales from Traditional Greek Karaghiozis, Traditional Balinese Wayang and "The Flying Pig Fish," a timeless and colorful tale of fun and acceptance! Performances are available for schools, libraries and museums. Each show is forty to sixty minutes long with a Q&A period at the end. Contact ShadowLight for assembly performance rates.